With the number of people entering Colombo daily expected to rise by about one million in the next four years amid nightmares of mega-scale traffic snarls, transport plans befitting a megapolis have already been drawn up, the Sunday Times learns. Megapolis and Western Development Minister Champika Ranawaka, a Moratuwa University alumnus, told the Sunday Times that high priority had been given to the project in view of the increasing vehicular traffic in the city. “If we do not implement this project as soon as possible there will be huge traffic congestion within the city and outside entry points. The loss to the economy will be very high. So we have to address this issue on an urgent basis,” he said. Moratuwa University’s senior lecturer G.L. Dimantha de Silva, who is attached to the Transportation and Engineering Division of the Department of Civil Engineering, said they were studying the mega plan, for which the Ministry of Megapolis and Western Development and the Ministry of Transport had obtained cabinet approval. 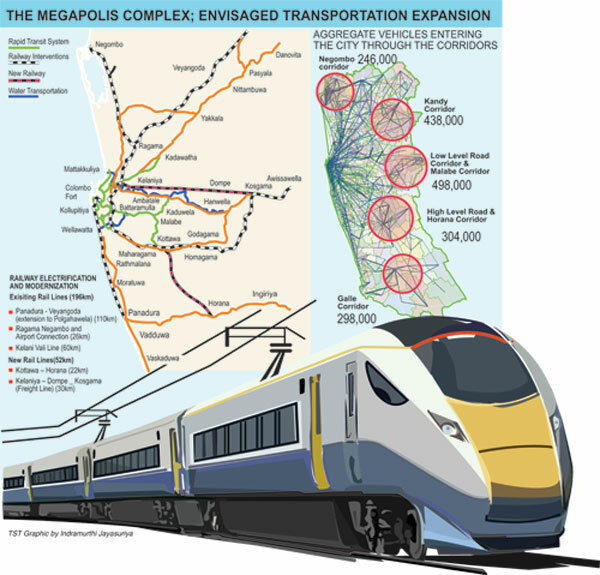 The plan includes the introduction of electric trains and modernisation of tracks. A 22-km-long new railway line between Kottawa to Horana will be built for passenger service and a 30-km-long line from Kelaniya to Kosgama via Dompe will be built to carry cargo. The existing line between Panadura and Veyangoda will be electrified. It will be later extended upto Polgahawela, covering a distance of 110 km. Also earmarked for modernisation or electrification are the 26-km-long Ragama-to-Negombo line with connection to the Colombo airport and the 60 km-long Kelani Valley line. A Light Railway System (LRS) similar to a tramway system will be operated in the city and the suburbs, covering areas patronised by a large number of people. LRS lines will operate from Fort to Maradana via Kollupitiya, Bambalapitiya and Borella – 15 Km; from Maradana to Mattakkuliya/Peliyagoda; from Dematagoda to Bamabalapitiya and Kirullapone via Borella (10 Km), from Borella to Battaramulla (10Km); from Battaramulla to Kottawa via Malabe (9Km); from Malabe to Kaduwela (6KM) and from Peliyagoda to Kadawatha (10Km). An inland water transport system too will be introduced. It will cover areas between Battaramulla and Wellawatta; between Union Place and Fort on Beira lake and between Mattakkuliya and Hanwella on the Kelnai river. The grand plan also envisages a school bus service to specified areas while a dedicated lane for buses will be introduced on roads with six lanes. Megapolis and Western Province Development Ministry Secretary Nihal Rupasinghe said the project was drawn taking into consideration the increasing population and vehicular traffic. He said the support of line ministries and institutions would be obtained to implement the project. “With the implementation of the project, we believe we can reduce the congestion and save fuel and time,” he said.